Hailing from Medicine Hat, Alberta, Canada, Terri got her start playing for tips at Tootsie’s Orchid Lounge, a honky-tonk bar across the alley from Nashville’s historic Ryman Auditorium. She signed with Mercury Records and emerged as a distinctive voice on the country music landscape – driving, passionate, spirited – and every bit her own woman. 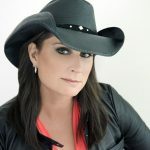 Terri has sold over five million albums and achieved Gold, Platinum, Double Platinum, and Triple Platinum status as certified by the CRIA and RIAA. She also has the honor of being the only Canadian female artist to be a member of the Grand Ole Opry. Terri is a dynamic, no-holds-barred live performer and one of the rare female country artists capable of throwing down some impressive guitar work. Terri has toured with such superstars as Brad Paisley, Toby Keith, Brooks & Dunn, Reba McEntire, and George Strait. In addition, she continues to headline sold-out tours throughout Canada. Recently Terri ventured into an exciting new chapter of her career as radio co-host of “America’s Morning Show” with Blair Garner. They can currently be heard across the country on Cumulus Radio NASH-FM stations. She is well on her way to establishing her position as an all-around entertainer in the country music industry.